The Westchester Medical Center Foundation is grateful for the generous support and strategic partnership of foundations and corporate benefactors whose support has made a tremendous impact on the patients and families of the Hudson Valley. Their support has provided funding for renovation, innovation, increasing capacity in our facilities, enhancing patient experience and investing in technology. The WMC Foundation oversees relationships with foundations, corporations, and other institutions who engage in philanthropy on both a local and regional level. Sponsorship levels range from $25,000 to $100,000. Our development team can create a package that is tailored for your organization. 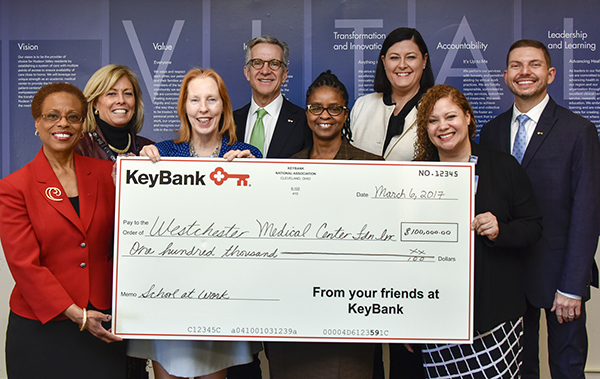 Corporate sponsors and partners give WMCHealth the opportunity to create a better world for the residents of the Hudson Valley and Fairfield County through the power of collaboration for our patients and your employees. Corporations who align with WMCHealth create regional awareness and assist in providing the highest quality care for all residents of the Hudson Valley. Your investment in WMCHealth helps us continue to improve countless lives. If you are interested in foundation, corporate support or strategic partnership with the Westchester Medical Center, please contact Lianne Hales Shaw, Executive Director at 914.493.2575 or Lianne.Hales-Shaw@wmchealth.org. Please join us as we continue A Legacy of Advancing Care. Here.